Ron Carlson continues this two part series over items that are easily missed when a bid is being created. The majority of theses items are smaller but they can add up quickly. A few items Ron talks about are the prep work that goes into a painting project, driveway repairs, sprinkler systems, etc. Listen in to hear the full list of items that are most commonly missed! Ron: Hey everybody, my name is Ron Carlson and I’m with Renovation Gurus, and I am a general contractor in the Dallas/Fort Worth area, and today I will be your host in the REI Classroom. I want to talk to you today about items that are easily missed on a rehab bid. This is part two of the one of two series of items that are easily missed. Ron: So, continuing on from my prior discussion, items that are missed, trash and debris haul off. It is unbelievable how much trash and debris you’re going to have at a property. It’s one of those things that’s almost impossible to calculate, but rather, you’re just doing a small little paint job or you’re doing a full rehab, you have trash. Trash will be at the house. Calculate for it, and probably calculate extra for it, because you will have way more trash on a rehab than you could possibly think or imagine. Landscaping, a lot of people miss, especially the major items when they’re doing, let’s say landscaping lights or the trim. Some people will put mulch on there, but then miss say, the landscaping trim bed or stones or rocks, bushes, things like that. A lot of people will put to paint a property, but they forget that before you paint a property, you have to paint prep. So, a lot of times you need plastic. You need masking tape. You’re going to be taping off some of the wood, maybe taping off the trim, depending upon if you’re doing the doors and trim a different color. You have a lot of masking tape and a lot of plastic, and with the paint prep also comes the texture, the hole patches, that type of thing. That is an additional expense on top of actually painting the house itself. Broken rafters, a lot of times, especially in Texas where we are, it looks like the property has foundation problems, and it might, but sometimes that causes broken rafters. Broken rafters typically look in a house as if it’s just need some sheetrock damage, or it looks like somebody might have fallen through the roof, something along those lines. But the rafters are actually broken. It’s a structural problem most of the time and very easily missed because the rafters are typically covered up by insulation inside of the attic. Mailbox, whether it’s at the front of the house or it’s at the street corner, it seems that people walk past the mailbox, and it doesn’t even exist. It has no address on it. The mailbox is absent, but most houses need a mailbox. Driveway repairs, you can pull into the driveway. Your car will be sitting on a bad driveway, and you don’t realize that it needs a driveway, whether concrete or asphalt or stone or whatever it is, but sometimes we just overpass the driveway because we’re so excited to look at the interior and exterior of the house. On a final clean, a lot of contractors, when they do a final clean, they do a construction clean, and that does not include windows. If you want your windows clean, make sure that your contractor is bidding you up properly to clean both the inside and the exterior of the windows. Some contractors will only do interior or only do exterior, and you need to make sure that’s on your final bid. Numbers on the driveway, numbers on the house, numbers on the mailbox, for some reason, the address is missed. Sometimes they cost $3, or $4, or $5 per number, and you know, depending on what you do, spray paint them or you get the numbers, they’re missed. And it’s one of those little things that you can add to your house that’s going to make it pop when the buyer walks up to the property. Sprinkler systems, they’re always hidden in the garage. They’re always hidden in a closet. For some reason, we miss sprinkler systems completely, and you might want to look one, to see if a property has sprinkler systems, and two, get it tested. Smoke alarms, every smoke alarm in the house, if it has a battery, you need to replace the battery, and we miss them. You need them in the rooms. You need them in the common area, and you need them in the hallway. If the hallway turns, you need another one. And hardwired is the best way to go, but we always miss smoke alarms and then fire extinguisher. You should have at least one fire extinguisher if not two. Some cities require it in the garage and under the kitchen sink. 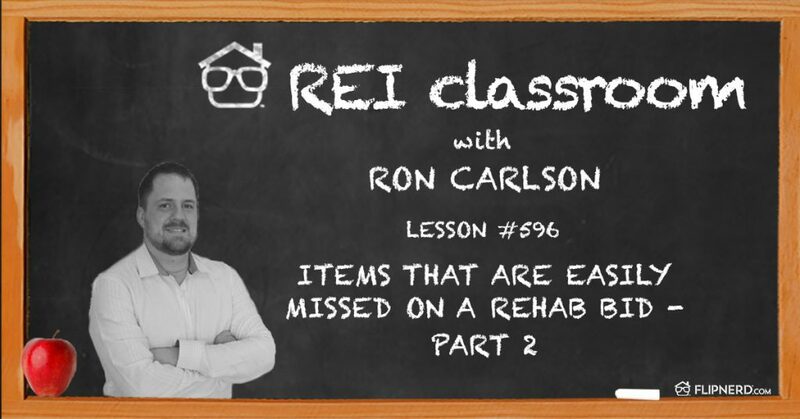 Those are just a couple of items that are easily missed that you might want to budget for in your rehab. My name is Ron Carlson. I’m with Renovation Gurus. 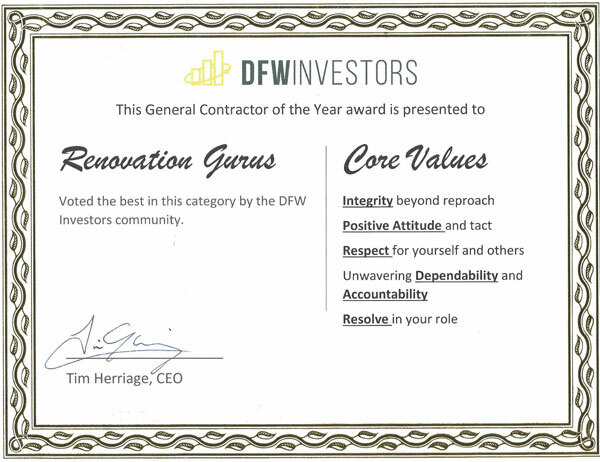 You can reach us at 855-99-GURUS or email at admin@renovationgurus.com.